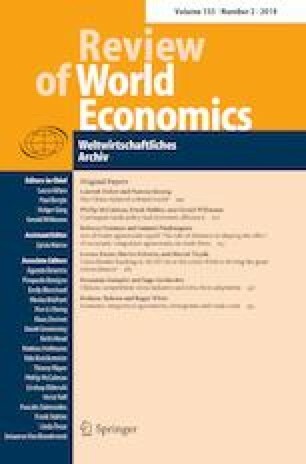 Using data on the levels of economic integration agreements (EIAs) among 172 countries (35 OECD members and 137 non-members) that span the years 1995–2009, we examine the effects of immigrants and EIA levels on bilateral trade costs between immigrants’ host and home countries and whether the influence of immigrants on trade costs varies across types of EIAs. Results obtained from the estimation of a series of augmented gravity specifications using the multi-level mixed effects model (random intercepts and coefficients) indicate that increases in the level of EIA and in the stock of immigrants are associated with declines in bilateral trade costs (measured both at the aggregate level and across sectors). However, the trade costs-reduction effect of immigrants varies non-linearly with the extent to which their host and home countries are integrated. While heterogeneous across country pairs, the effect of immigrants on trade costs remains strong even among country pairs at the peak EIA level, implying that the effects of immigrants on international economic interactions is both expansive and broader than often understood. Tables 7, 8, 9, 10, 11 and 12. Bergstrand, J. (2017). Database on economic integration agreements. https://www3.nd.edu/~jbergstr/. Accessed April, 2017. Centre d’Etudes Prospectives et d’Informations Internationales (CEPII). (2017). Gravity dataset. http://www.cepii.fr/CEPII/en/bdd_modele/presentation.asp?id=8. Accessed April 1, 2017. Organization for Economic Co-operation and Development (OECD). (2017). International migration database. http://www.oecd-ilibrary.org/statistics. Accessed September, 2017. World Bank. (2017). World development indicators. http://data.worldbank.org/data-catalog/world-development-indicators. Accessed May 1, 2017.